Yo, ho, ho! If ye be wantin’ to play the most swashbuckling slots adventure in the history of the internet, Ghost Ship is the one you’ll be tryin’! Now, I know what you’re thinking: I haven’t set sail on the high seas in search of loot beyond my wildest dreams in months; what if I’m rusty?! Well, fear not. Not only is Ghost Ship an incredibly fun game, it’s also super easy to play. If you’re still not convinced, let’s take a few minutes to go over the ins-and-outs of what is just the latest addition to one of the most comprehensive collections of casino titles available on the web. First, you’ll simply need to load the game on your computer. If you’re using a PC, you can take your pick between playing directly from your browser or downloading our comprehensive gaming software. Whichever option you choose, the next step is to decide on how much you’d like to bet, as well as how many lines you’d like to play. Remember, there are abundant treasures waiting aboard the Ghost Ship, and you don’t want to miss out on huge winnings. That’s why we suggest maximizing your lines and adjusting your bet amount as necessary. That way, you’ll never need to worry about watching a winning combination slip away without the chance to rake in some serious cash! With your bet selected, all you need to do is hit the spin button, and you’ll be on your way into the dark and mysterious sea in search of some of the biggest treasures you’ll ever find. If you’re after the big winnings, you’re going to want to know about two special symbols that you’ll see in Ghost Ship. First, there’s the Ghost Captain. This salty sailor should whet your appetite for winnings, because he can substitute for almost any other symbol in the game. If you’re going to sail your way to riches, it never hurts to have a Ghost Captain (or two!) on your side! The second symbol to keep an eye out for is the Ghost Ship. This mighty vessel can spell free games and awesome prize multipliers for intrepid adventurers who collect three or more in a spin. If you happen to land five Ghost Ships in a single spin, you’ll be receiving an unbelievable ten times multiplier on each and every free spin! If you think that sounds lucrative, you’d be correct! 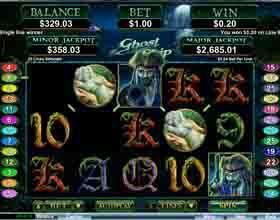 With Ghost Ship, big winnings could be coming your way after each spin. With the possibility to win up to 25,000 times your bet for each line, there’s plenty of chances to cash in if you’ve got what it takes to board the ghastly vessel. Take your pick of up to 25 paylines, and get your adventure started. With a major progressive jackpot that resets at $1,000, as well as a minor jackpot that resets at $250, your courage could pay serious dividends on this slots adventure! The time has come to brave the high seas and claim your prize… if you dare!